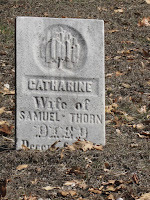 March is Women’s History Month, a time to explore how women are remembered - in the cemetery. 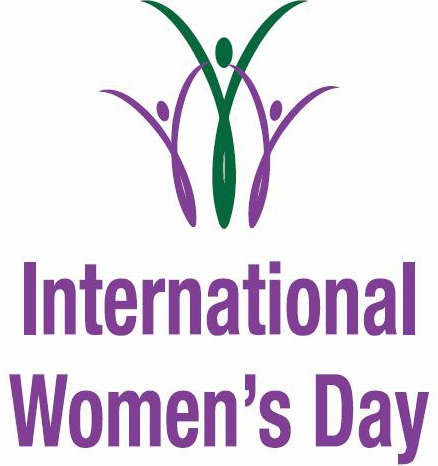 On March 8, 1911 the first International Women’s Day was celebrated in the U.S. The Women’s Suffrage Movement was beginning, not only in this country but also throughout Europe. Women had decided to band together to demand equal and fair treatment, including the right to vote. 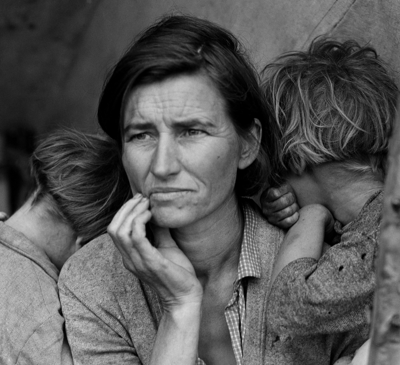 Unfortunately, what those women fought so hard for was put by the wayside when our country tumbled headfirst into the Great Depression of the 1930’s. Then war broke out in 1941. Women stepped up and came into their own, taking jobs that had only been held by men, prior to the war. It took WWII to finally place women on a more fair footing with men, only to have it taken away in the 1950’s, as women were relegated back to domestic life, to raise the children and tend the home fires. The upheaval of the 1960s and the women’s movement of the 1970s finally brought about the lasting changes that many of our grandmothers and great-grandmothers had started fighting for in the early 1900’s. 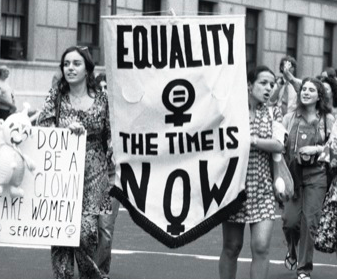 It was 1981 when the U.S. Congress proclaimed the week of March 8 (an acknowledgement to the original International Women’s Day celebration of 1911) as National Women’s History Week. 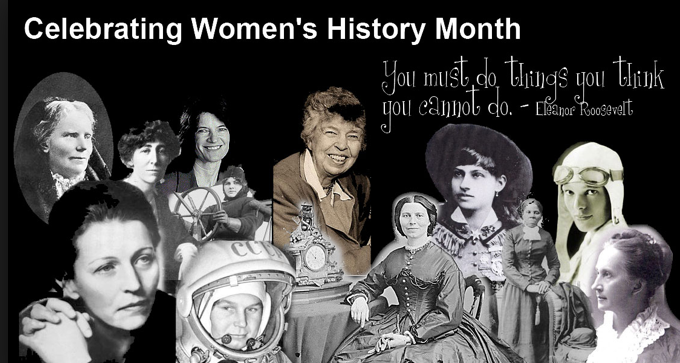 In 1987 Congress declared the month of March to be Women’s History Month with the purpose of honoring women and remembering their sacrifices and contributions to the world we live in. Although times have changed, they still remain the same. You will find the women of the cemetery usually bear one of these descriptive names on their stones to describe their station in life; daughter, sister, aunt, wife, mother, grandmother, widow. On older stones, the term consort or relict was used to describe the woman’s marital status. From the 17th through 19th centuries, consort was usually used on the graves of women, although a man could also be a consort. The word consort was normally used in this manner: "Nancy consort of John Clark." Consort meant that Nancy was John’s spouse and died before her husband did. There is no other information listed. The fact that she was married to John is all that’s left as a reminder of her life and identity. 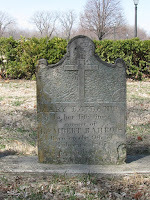 Mary LaPlant faired better in regard to information about her life. Mary was the consort, or spouse, of Lambert Barrots. 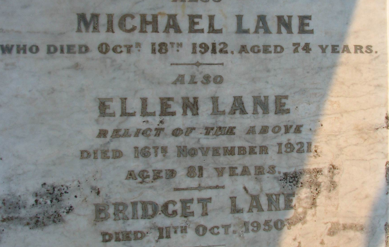 Both her birth and death dates were listed along with ‘LaPlant’, which was probably, her birth name possibly used as a middle name. Relict was another term from the 17th and 18th centuries that meant the woman was the surviving spouse of the marriage and had not remarried. Relict was used much as our term widow is used today to describe a woman whose spouse has died before her. Daughter describes any female descendent or offspring. Charlotte Snyder was a daughter. Unfortunately we do not know whose daughter, nor do we know the exact dates of her birth or death. ‘Mary dau. (daughter) of L.J. & M.E. Miles’ had a more detailed stone. Mary’s death date and age were listed, along with the symbol of a rosebud, used to indicate the lose of a young life. Sister is a female who has both parents in common with another offspring. Sister is not as prevalent on gravestones as other relationship terms. Two sisters will share this marker. Each has her married name on the stone. Unfortunately, for genealogy purposes, we do not know what their birth name was. Aunt describes a female who is the sister or sister-in-law of your parent. With this stone designation of Aunt, we may assume that Hannah never married. Her birth and death dates were listed, along with her middle name. Wife is the female partner in a marriage. 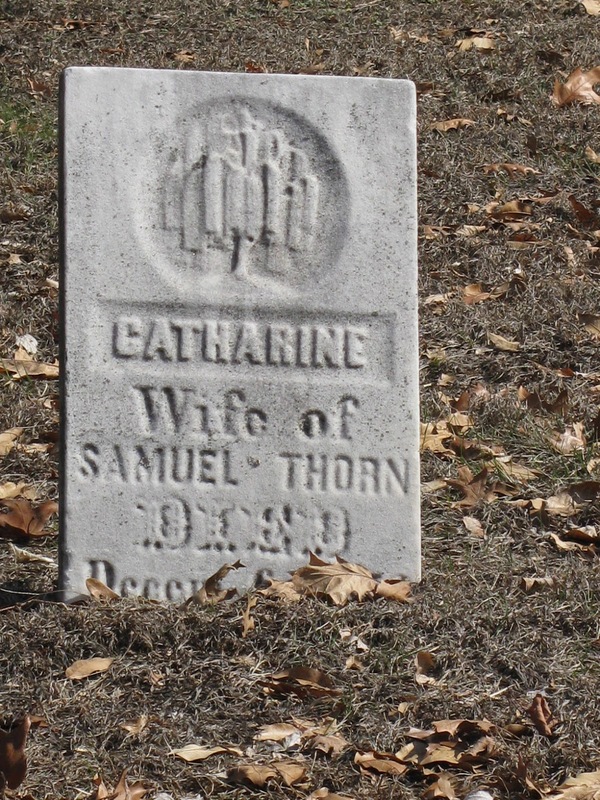 Catharine – wife of Samuel Thorn with a date of death listed, although covered up by years of soil buildup. Samuel had a willow tree placed on the stone, a symbol of mourning. Anna B. was the wife of John G. Frisz. Anna’s birth and death years were listed and her stone was very substantial and ornate. Then there are the stones that hint of plans gone awry – This couple’s stone showed Edward’s birth and death years, but for Ella, only the year of her birth. Did she move away, remarry or did someone just forget to have the date of her passing engraved on the stone? Mother – a female, who has given birth to a child, adopted a child or raised a child. The female parent. Myrtle’s stone indicated that she was someone’s mother and the year of her birth and death. Grandmother – The mother of your mother or father. Grandmother is another designation, which is seldom found on gravestones. Naomi Graves Bray was honored with the term ‘Grandmother’ placed on her stone, along with her birth and death years and a religious symbol. This stone tells us only that Elizabeth was buried here, along with her birth and death years. No last name, no relationship designation. 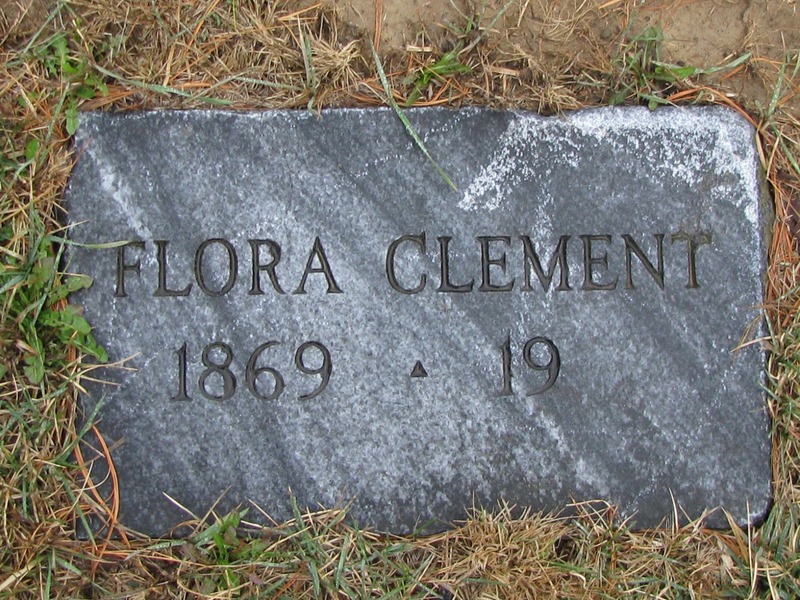 Here, a bit more detail, Flora's last name - Clement. A birth year was given, but no death year. This stone is intriguing. 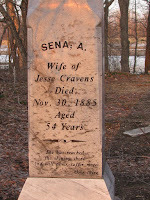 The large marble marker was used for the grave of Jesse Cravens' wife who died in 1885. A four-line epitaph was engraved at the bottom. But I find the semicolon a mystery. Was it used to indicate an omitted or unknown letter? 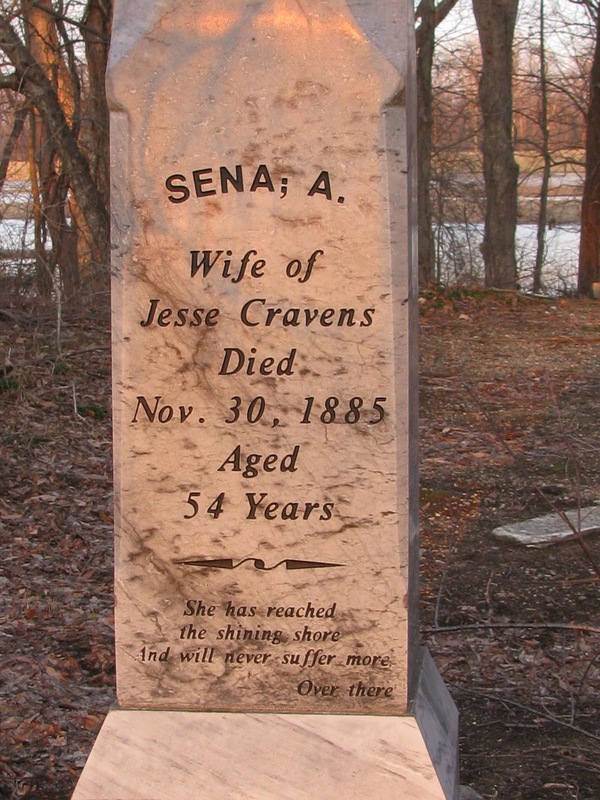 If so, then Jesse Cravens had nothing to do with this stone, as he should have known the spelling of his wife’s name. So who had this stone erected? And why use a semicolon instead of a question mark if the letter or letters were unknown? Does any one have any ideas? This stone tells of someone much beloved: someone who was considered "Darling". It seems only fitting to close out with a stone that seems to sum up Women’s History Month. Bill, let me know what you find.